Unsure about Brussels sprouts? Get ready. This is the recipe that may change your mind. 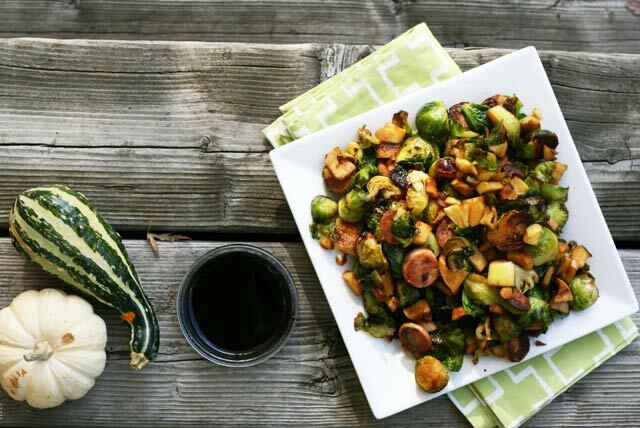 Technically, this recipe could be called “Brussels sprouts with chicken sausage, dates, apples, and a Balsamic glaze”. But who wants to be technical? I adapted this recipe on Ari’s Menu, giving it a bit of a cheap recipe makeover. I used one apple chicken sausage link from a package of five from Trader Joe’s, an apple that I picked from a neighbor’s tree (with permission!) and fake Balsamic vinegar that tastes just like the real stuff. Whether you’re making this for a Thanksgiving side dish or a hearty meal all for yourself, you’re not going to spend a lot of money. And if $3.39 is all it’s going to take to make you a Brussels sprouts fan, so be it! Save any leftover Balsamic glaze to drizzle on top of salmon, salad, crostini, roasted vegetables, or pizza. Whatever you do, don't throw this delicious sauce away! To par cook Brussels sprouts: Fill a large saucepan with water and bring to a boil. Add Brussels sprouts and cook for 2 to 3 minutes. Drain and set aside. Heat olive oil in a large frying pan over medium-high heat. Add Brussels sprouts, flat side down (but avoid adding any leaves that have fallen off) and cook for 5 to 7 minutes, or until they begin to turn golden brown. Add sausage and apple and cook for a minute or so. Finally, add dates and any leftover Brussels sprout leaves. Cook for another minute or two, until heated through. Serve warm with Balsamic glaze on the side. Yum! This sounds fantastic – love the flavor combination! The brussels sprouts dish looks very, very, good. A favorite – brussels sprouts! Thank you for the recipe! Thanks – I’m always looking for more brussel sprout recipes.